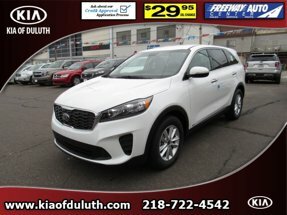 Description Make sure to get your hands on this 2019 Kia Sorento EX V6 AWD with a backup sensor, push button start, backup camera, blind spot sensors, parking assistance, Bluetooth, braking assist, dual climate control, hill start assist, and stability control before it's too late! It has a 6 Cylinder engine. We've got it for $39,095. Want a SUV AWD you can rely on? This one has a crash test rating of 5 out of 5 stars! The exterior is a charming passion red. Come see us today and see this one in person!